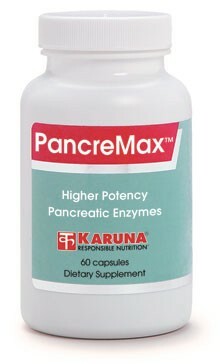 PancreMax provides a strong 10X concentration of pancreatic amylase, protease and lipase enzymes from freeze-dried porcine source, for reliable support of the intestinal phase of digestion. Adequate protease activity ensures thorough breakdown of food proteins for optimal amino acid absorption and for avoiding inappropriate absorption of food antigens. 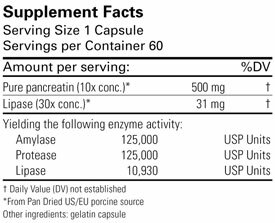 High lipase activity supports absorption of essential fatty acids and fat-soluble vitamins, and prevents complaints associated with eating high-fat meals. Individuals with pancreatic insufficiencies excrete undigested fats and proteins in their stools and, as a result, also lose essential fatty acids and fat-soluble vitamins (J Clin Gastroenterol 1999;28:3-10). Supplementary proteases ensure proper protein digestion, helping to reduce potentially allergic food proteins to hypoallergenic free amino acids (Inflamm Res 2002;51:S13-4). High lipase activity is essential for preventing complaints associated with eating high-fat meals (Dig Dis Sci 1999;44:1317-21). Suggested use for adults: 1-2 capsules per meal, or as directed.